Author Lesley Downer’s new novel, The Shogun’s Queen, is set largely in the shogun’s ‘harem’, the Women’s Palace in Edo Castle in nineteenth century Japan. No westerner ever visited the Women’s Palace or even knew it existed. The women were sworn to secrecy and even after the palace closed down in 1868 very few ever revealed anything of their lives there. At its pinnacle it was home to three thousand women – far more than populated the Topkapi Harem in Istanbul – but only one man, the shogun, ever entered. One shogun enjoyed the attentions of twenty seven concubines and had fifty three children. The Women’s Palace was a place of enormous luxury and beauty but it was also a prison. Once you entered you would never leave. Yet the women wielded enormous power. There were conspiracies, murders, even hauntings inside this gilded cage. Women sneaked out to meet their lovers or smuggled a lover in in a trunk, though there were dreadful punishments for those who were caught – crucifixion for the lovers, hara-kiri for the father of the offending woman, even if he knew nothing of the woman’s offence. Lesley will tell stories of the life and luxury and intrigue of the Women’s Palace. She will weave her talk around the story of Princess Atsu, the Satsuma girl sent at the age of twenty to be the shogun’s bride. Atsu had a secret mission to accomplish which set her against the shogun’s formidable mother, the most powerful woman in the palace. She is the heroine of Lesley’s new novel, The Shogun’s Queen. 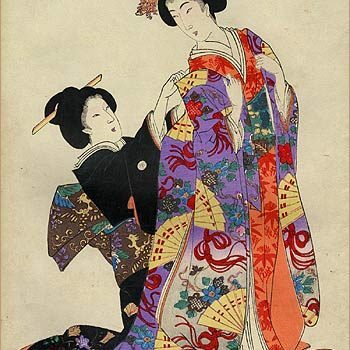 To illustrate there are photographs and woodblock prints of the women and their gorgeous kimonos, furnishings and tea and incense ceremony implements. Lesley Downer first went to Japan more than thirty years ago and her life has revolved around Japan ever since. She is the author of many books on Japan, including Geisha: The Secret History of a Vanishing World, Madame Sadayakko: The Geisha who Seduced the West and the first three in The Shogun Quartet, a quartet of novels: The Last Concubine, The Courtesan and the Samurai and The Samurai’s Daughter. Her new novel, The Shogun’s Queen, is a prequel, chronologically the first in the quartet, and begins at the moment when Black Ships are sighted off the coast of Japan. It was published on 3 November 2016.